Participate in AU|SLO Activities with Free Membership! 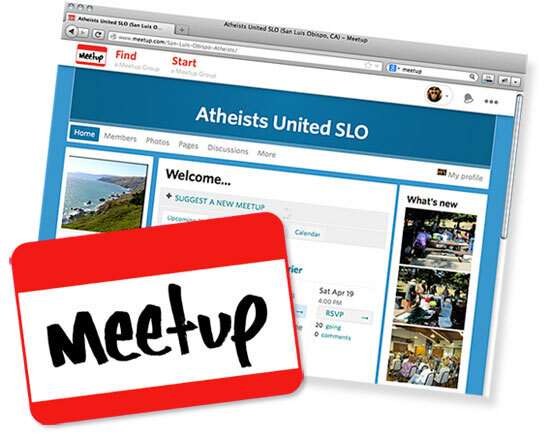 AU/SLO uses the Meetup.com website and service for announcing and organizing our events. The best way to participate is to visit our Meetup page and create a free AU/SLO Meetup account to get details and locations for our events and RSVP to reserve your spot. Click here to create a free AU/SLO Meetup membership and view AU/SLO activities. Become a Premium Member of AU|SLO! Available to anyone enrolled in high school or college. Available to all immediate household members. Never worry about renewal again! Qualify for inclusion as a supporter of all AU/SLO events now and for the future! Becoming a Premium Member entitles you to free or discounted access to paid AU/SLO events as well as special invitations to dinners and private gatherings with AU/SLO guest speakers. Most importantly, your membership helps contribute to the growth and well-being of AU/SLO. Your dues will help to sponsor events and outreach that continue to foster the atheist message locally as well as to help fight for separation of Church and State issues that arise in our community. Outreach booths at farmer’s markets and other community events. Sponsoring guest-speakers from the atheist / secular community. Hosting Atheist Film events, Seasonal Social Events such our free Annual Summer BBQ and the Holiday “Hitchmas” Party. Promoting ongoing educational events such as the Skeptics Discussions and Science “Salons” that engage members with critical thinking and learning about the natural world around us. Funding College Scholarship for high school students and youth Camp Quest Scholarships. Premium Membership is for the current calendar year. However those who join in October, November or December qualify automatically for the next calendar yeargetting up to three months free! Note: If you’d prefer, you can send a check to our PO box (P.O. Box 12126, San Luis Obispo, CA, 93406-2126) with a note in the Memo that the donation is intended for Premium Membership.